Gov. 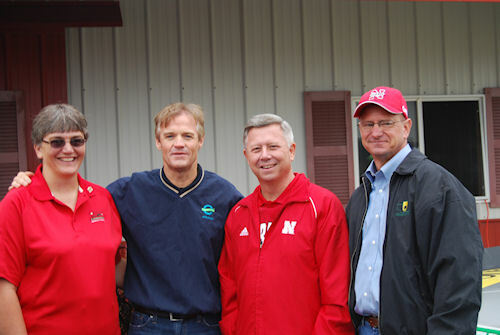 Heineman, NASCAR driver Kenny Wallace promote biofuels at Husker Harvest Days. The benefits of the renewable fuels ethanol and biodiesel were heralded at Husker Harvest Days Sept. 14 when Nebraska Gov. Dave Heineman declared September as Renewable Fuels Awareness Month in Nebraska. The proclamation was coordinated through the Nebraska Corn Board and Nebraska Soybean Board, both of which hosted the event at Husker Harvest Days to recognize the contributions of Nebraska farmers and agribusinesses to the nation's renewable fuel supply. Promoting biofuels at the Commodity Building during Husker Harvest Days were, from left, Lisa Lunz, chairman of the Nebraska Soybean Board; Kenny Wallace, NASCAR driver; Gov. Dave Heineman; and Alan Tiemann, chairman of the Nebraska Corn Board. "Nebraska's renewable fuels sector contributes to local communities by providing good paying jobs for thousands of Nebraskans," Heineman said. "Renewable fuels are a critical component of becoming energy independent and by providing an alternative to imported oil. We are fortunate to have a strong biofuels industry with thousands of Nebraskans working to fuel America." NASCAR driver Kenny Wallace also attended the ceremony. One of Wallace's sponsors this year is American Ethanol, which is supported in part by Nebraska farmers through the Nebraska Corn Board. "I've been across the country meeting farmers and it is really exciting to see their commitment to ethanol and all renewable fuels," Wallace said. "Biofuels bring so much good to rural communities and they keep more of our energy dollars in this country where they belong. I'm proud to promote ethanol and really appreciate knowing that there's ethanol in every tank when we're on the track each week." NASCAR switched to Sunoco Green E15, a 15% ethanol fuel, this year. Alan Tiemann, chairman of the Nebraska Corn Board, and Lisa Lunz, chairwoman of the Nebraska Soybean Board, also addressed the crowd. "Across the country ethanol provides more than $3 billion in local, state and federal tax revenues and provides thousands of jobs, including more than 2,000 in small-town Nebraska," said Tiemann, a farmer from Seward. "At the same time, ethanol plants produce millions of tons of the livestock feed distillers grains, which are widely used not only in the United States but around the world." Tiemann noted that ethanol production across the country is at an all-time high and surpassed 13.2 billion gallons last year. Lunz, a farmer from Wakefield, said soy biodiesel is seeing new and exciting uses across the country, including in BioHeat, a heating oil blended with biodiesel used to heat millions of homes and businesses, primarily in the Northeast. "The increased industrial demand of soybean oil for biodiesel, including for BioHeat, ultimately increases the supply of the feed ingredient soybean meal. That's good for livestock producers right here in Nebraska," she said. "We thank the governor for his support of Renewable Fuels and Nebraska agriculture and we know that by working together, the future looks brighter, cleaner and greener for Nebraskans."